Last Monday I had a great workshop that went very well. I was quite nervous about the workshop because I had never taught it before. It was on the basics of oil painting and painting in general. It was an information session about things you may want to know about painting and and the oil painting medium. I covered everything like paint make up, brushes, painting surfaces, solvents and ways you can avoid them, pallets, oils, color theory, etc. It was a lecture where I encourage sidetracking with questions, really that is why people come is because they have questions to ask. I think I may have to run it again either in the new year or next fall. If you are interested please contact me daphne@cotesystems.com . The other pictures above were in the local paper of me painting last weekend during the Alberta Arts Days. Just to clarify, because they made me look like I wasn't a very good painter, they printed in the caption that I was painting my son, when in fact I am painting my daughter (hence the pink shirt and only a slight resemblance to my son in the right hand picture). As for my daughter and her hand, I still haven't tackled the painting. Since last weekend she has had 3 casts, and she gets another one on Wednesday. She has been keeping us on our toes and strengthening our backs. She is quite snugly and needs extra love day and night! So there hasn't been too much work on anything this week. I was just glad to get a bit of time to finish my self portrait. I told my husband that was going down stairs to do some laundry. An hour later he came down looking for me and found me in my studio painting away. The good husband that he is, he said "That's looking really good. I'll make lunch". Hey Daphne, it is so great to discover your blog too, and thank you for your comments! 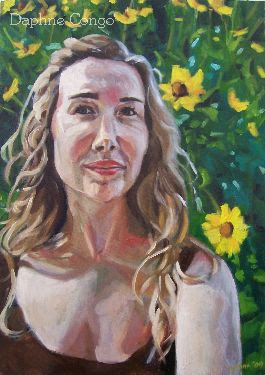 This self portrait is fantastic, I love the light and grays in the skin tones. I'm looking forward to following your work! Great blog! I really liked your entry for the DSFDF San Francisco Rooftops challenge.